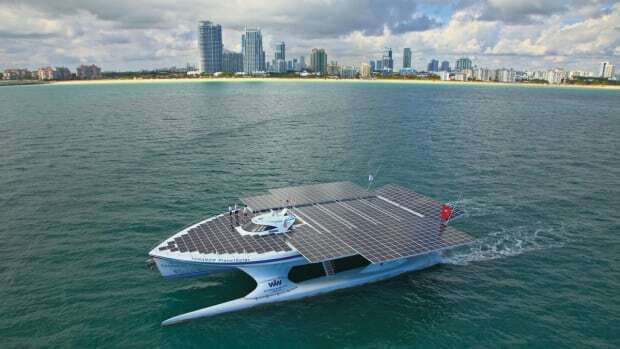 MS Turanor PlanetSolar, the world’s largest, solar-powered yacht ever constructed, made its first U.S. stopover on June 3rd at Sunset Harbour Yacht Club (SHYC) in Miami, FL., South Florida’s only five-star, green marina. Even considering all means of transportation, the MS Tûranor PlanetSolar is the first vehicle to successfully circumnavigate the globe solely using solar energy. After more than 19 months, the largest solar-powered ship ever built crossed the finish line in Hercule Harbour in Monaco May 4. The journey of 32,286 miles took the vessel and its crew through all the oceans and touched every continent.